Utah's central location in the western United States has always meant a steady flow of traffic across its expanse, and has earned the state-nickname "The Crossroads of the West." As early as the 18th century Spaniards and New Mexicans began exploring Utah in search of "short-cut" routes to the western coast. Their efforts resulted in a popular trade route known as "the Old Spanish Trail." In the first half of the 19th century, trappers and mountain men further explored the state plotting and mapping routes as they went. Their trails were used by thousands of pioneers and adventurers heading west. 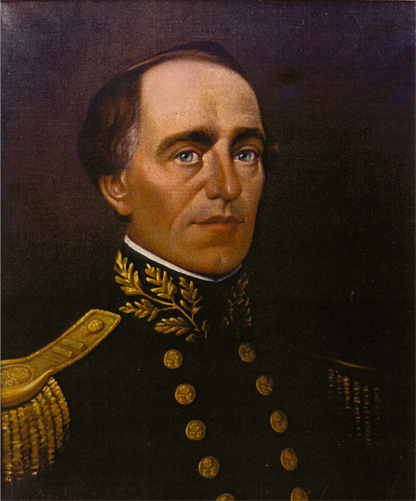 U.S.government surveyors began exploring Utah in the 1840s, and one of the first was John Charles Fremont. 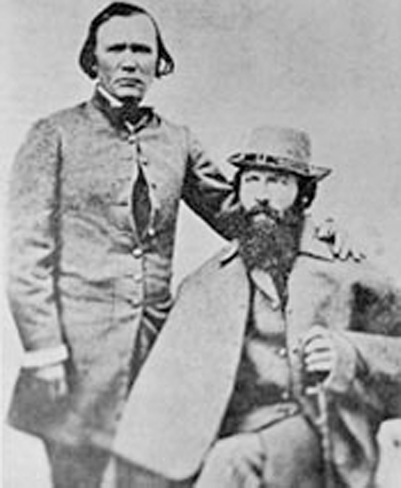 Often used mountain men as guides, Fremont generated reports and maps that provided valuable information for the government and helped stimulate westward migration. Fremont’s reports are said to have had a great influence on Brigham Young in bringing the Mormons to Utah. In May, 1843 while en route to the northwest,Fremont detoured south when he reached the area known today as Soda Springs,Idaho. He then headed south through Cache Valley toward the Great Salt Lake. Following the Bear River to its mouth, Fremont and his party continued south to the Weber River to a point about six miles west of present-day Ogden. Fremont then proceeded west to climbing to its summit of what is known today as Little Mountain. It was there he and his men could view the Great Salt Lake in its entirety. Fremont’s next exploration venture into Utah was accompanied by Kit Carson. The Surveyors reached an island (now Fremont Island) and made a telescopic survey. They drew a map of the Great Salt Lake from its rocky summit. 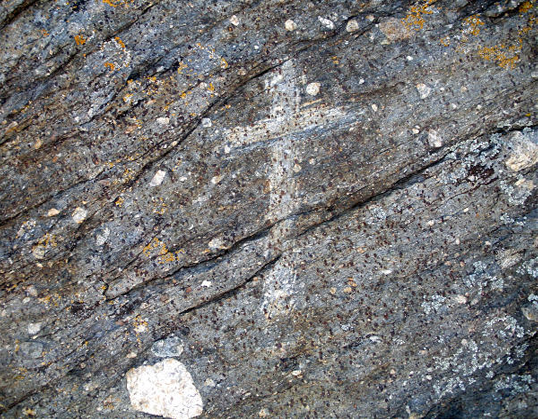 On September 9, 1843, the group carved a “large cross” which is still visible today. Fremont returned again with Kit Carson to Utah in 1845. On this exploration trip, he is credited with naming the area the “Great Basin” and documented the relationship among the lakes and streams in this area. One of the next records of surveying in Utah is associated with the arrival of the Mormons in July, 1847 and Brigham Young’s initial pioneer company known as the “Vanguard Company”. 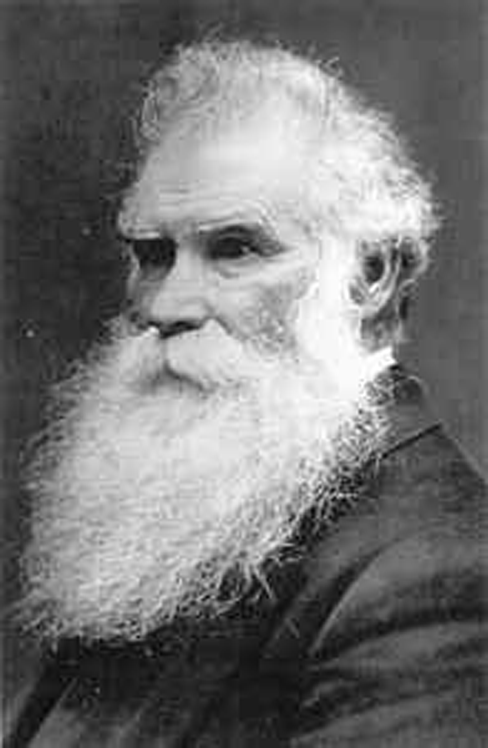 Orson Pratt, one of the Mormon Church’s Quorum of the Twelve Apostles, was a member of this group making their way from Missouri to Utah. Historians pay compliments to the engineering and scientific knowledge of Orson Pratt who acted as the Company’s scientific observer. With instruments which included: two sextants, one circle of reflection, two artificial horizons, two barometers, several thermometers, and a telescope. Orson cared for and used these instruments along the trail as he recorded the latitude,longitude and elevation at important landmarks. There are several different accounts of what exactly happened when the pioneers entered the Great Basin. One account credits “Orson Pratt with a number of men and wagons, leading the way down Echo Canyon, up East Canyon, through and over the Wasatch Mountains toward the shores of the Great Salt Lake. From the summit of Big Mountain, on the nineteenth of July, Orson Pratt and another member, riding two days ahead of their companions, caught the first glimpse of the valley: on July 21, 1847, Orson Pratt and Erastus Snow emerged from Emigration Canyon, a little south of where Fort Douglas now stands. Orson and Erastus had a single saddle horse, and were riding by turns. Erastus’s coat had fallen off the horse so he rode back toward the mountains to look for it, leaving Orson to walk on alone to the banks of City Creek. This stream then divided into two branches, one flowing south, and the other west. 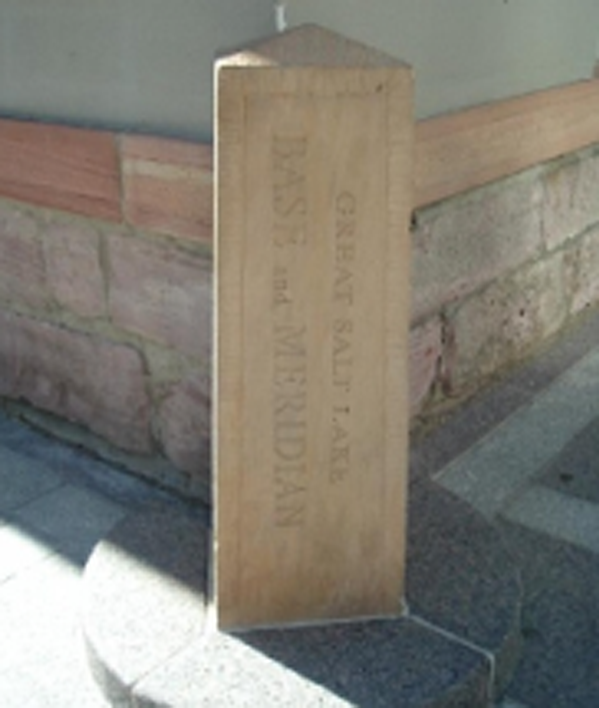 Thus it was Orson Pratt who was the first of the pioneers to actually walk the site of Salt Lake City. Two days later, Brigham Young and the Vanguard party arrived at the site. Pratt had already chosen the location for the future settlement. Brigham Young along with other leaders of the Mormon Church proclaimed that “this is the place” for Great Salt Lake City. 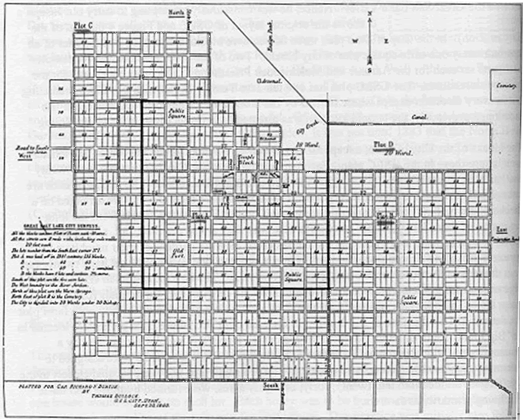 Brigham Young then gave the task of laying out the new city to Orson Pratt who, assisted by Henry G. Sherwood, ran the original survey of Salt Lake City, on Monday, August 2, 1847. The initial point located at the southeast corner of the Mormon Temple site was the point of reference for surveying the new city. With his equipment, Orson calculated the latitude and longitude of this point of reference, know today as the "Initial Point", by determining its altitude and azimuth based on astronomical observations. Orson’s initial calculations were: Latitude 40°46'04" - Longitude 111°54'00". This same location has since then been updated with survey grade Global Positioning System (GPS) measurements and found to be: Latitude of 40°46’10.27” Longitude 111°53’28.78”. The difference in the two readings equates to a distance of about 2,486 feet. That may seem like a significant error, but his calculations were for a point positioned on the surface of the earth – very impressive calculations considering the instruments available in 1847. Two of the next recorded surveyors to visit Utah were Howard Stansbury and Lt. John Gunnison. In the early spring of 1849, Stansbury’s party received orders from the government to make a reconnaissance of the Platte River Trail by leading his party west across the Wasatch Mountains to Salt Lake City. 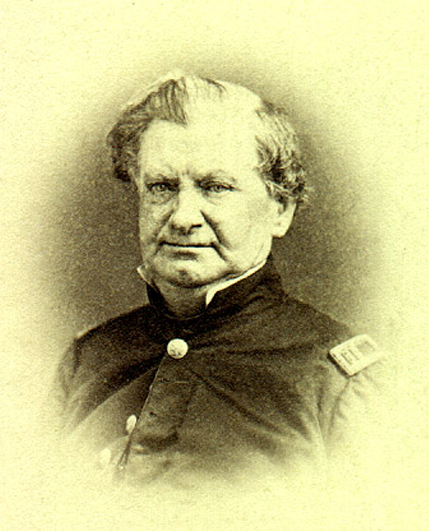 His tasks were to survey the entire valley of the Great Salt Lake, study the Indian tribes and the Mormons, locate a supply route from the valley settlement north to the Emigrant Trail and study the natural resources in the area. While stopping at Fort Bridger, Stansbury sent Gunnison with a supply train over the Mormon Trail into the Salt Lake valley. Stansbury had engaged Jim Bridger to lead his party to explore the country from the Bear River Valley to Ogden. After meeting up with Gunnison in Salt Lake Valley, they conducted a reconnaissance survey of the Great Salt Lake. Stansbury party is credited with being the first to completely circumvent the lake by land. The exploration team wintered in the Salt Lake Valley, completing their works by the following summer. On August, 1850, the exploration team left Utah after surveying and mapping the Jordan River,Utah Lake, and the Great Salt Lake. A few years later, under directions of Secretary of War Jefferson Davis,Gunnison was given the assignment to locate the best route for the Pacific Railroad. 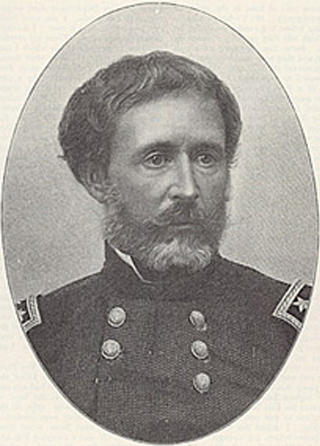 While exploring a portion of the Sevier River and Sevier Lake, Gunnison and six of his men were attacked and killed. How these men were murdered is unclear. Local Pahvant Indians were charged with the murders, but some accounts suggest that the murders may have been committed by white people disguised as Indians. We will probably never know who is responsible for these atrocities. 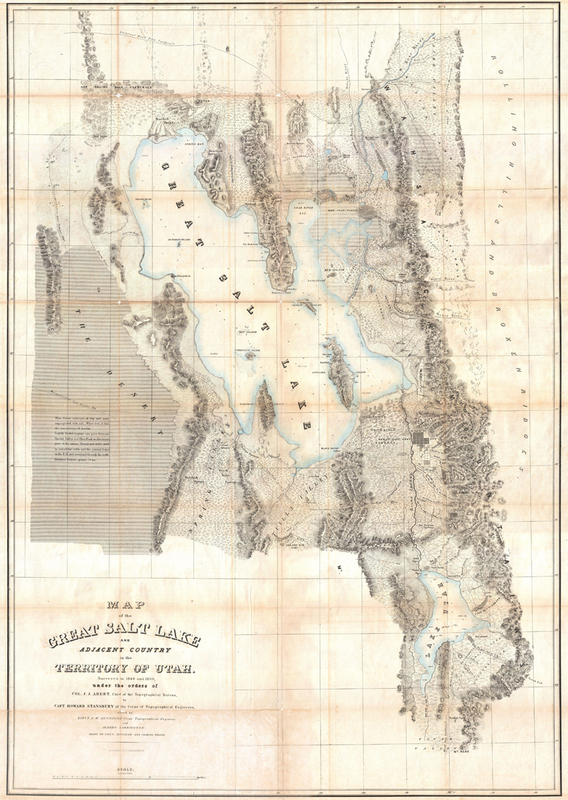 In August 1855, David H. Burr, first U.S.Surveyor-General of Utah used the initial point established by Orson Pratt as the initial point of public land surveys in Utah. He preserved the point with a stone monument. A replica stone is still stands in that position. 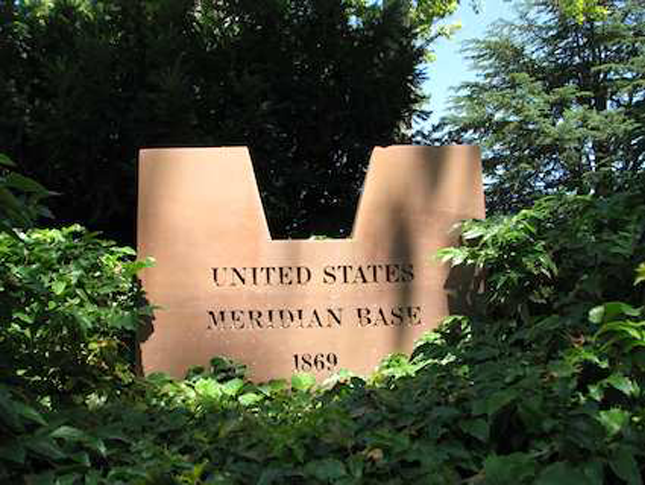 On September 30, 1869, an astronomical station, with a stone base which still stands 100 feet north and 50 feet west of the initial point was established by George W. Dean, U.S.C. &G. Survey. This monument was used for the purpose of determining true latitude and longitude. The station was also used to obtain correct time at the initial point until December 30, 1897. Because of conflict between Utah Territory and the federal government, the first land office was not opened in Utah until 1869. 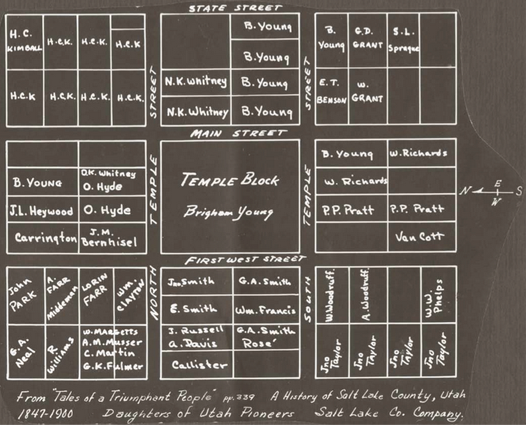 For the first 22 years after settlement the national land system did not extend to Utah Territory, but the Utah Territorial Assembly governed land ownership in Utah. The territorial government established methods of surveying and acquiring title. These practices and the documents they created were recognized in Utah Territory, but did not provide Utah settlers with federally recognized legal title to land. The territorial government also established county recorders as keepers of land records, and in 1888 the Territorial Assembly defined certain indexes and finding aids indexes and finding aids which county recorders were thereafter required to keep. There are many accounts of early explorers and surveyors of the state of Utah. Several of the cities and landmarks throughout the State bear the name of these surveyors. Most of Utah landmarks, streams and lakes were named by them. The impact that these adventurous surveyors and explorers had on the state is undeniable. Every parcel of land and every property owner in the state of Utah is in some way, and will always be, affected by the work of these surveyors who laid the ground work for "The History of Surveying in Utah”. Utah division of Archives and Records, Original Land Titles in Utah Territory. Utah History – Utah.com, Trails and Trailblazers.